How consumers engage with businesses is evolving dramatically, partly due to the evolution of Artificial Intelligence (AI). From Google Allo, Google Duplex, Microsoft XiaoIce, Amazon Alexa, Apple Siri to Apple iMessage Business Chat; the best organisations are using this technology to influence sales, improve customer service and drive customer engagement. As we saw in our earlier research into AI use cases “Turning AI into concrete value: the successful implementers’ toolkit”, organisations are using this technology to achieve a range of business goals. To understand AI’s impact on customer experience we conducted extensive cross sector research surveying 10,000 consumers and 500 executives from leading organisations to find out. Read the full report “The Secret to Winning Customers’ Hearts with Artificial Intelligence”. We found that consumers are increasingly more aware of when organisations are using AI, with nearly 70% of UK respondents aware they have had an AI enabled customer service. Convention might tell us that teaching a computer to imitate human behaviour isn’t what customers want, but it turns out we want our artificial intelligence to be human-like! We prefer AI that sounds like us, acts like us, and understands us. Consumers see clear benefits from AI enabled Customer Experience, stating that they are gaining control, anytime, anywhere, which is often faster and easier than human only service. For example, consumers are excited by the growth of personalised assistance (47% of UK respondents), and they are becoming more prescriptive about when and how they want it to be used alongside humans. 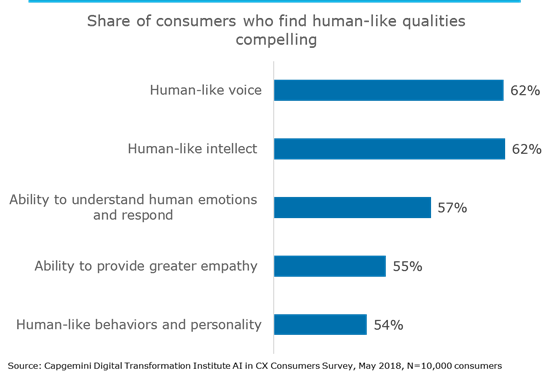 Source: Capgemini Digital Transformation Institute, AI in CX Consumers Survey, May 2018, N=5,032 consumers who know when they are having interactions with artificial intelligence and are satisfied by it. However, our enjoyment in the digital world, enabled by AI, isn’t yet ready for the physical world with more than 52% of consumers expressing discomfort with human-like physical features in bots. Interestingly, consumers are more willing to accept AI only interactions when purchasing lower value products, still preferring human interaction for high valued purchases, but most consumers prefer to have the choice between human and AI interactions. Consumers also want transparency in AI by design, with 65% of UK respondents requiring organisations state when an interaction is AI-enabled, explicitly. These are just a few of the findings and you can find out more by downloading the report and understanding the secret to winning customers’ hearts with AI. Becoming an “AI-first” company promises formidable opportunities, including higher productivity, quality services, speed and personalisation. Succeeding will take a strong vision and a robust digital strategy, but as our research finds, there are some clear front runners that we can learn from to build world class customer experiences. Whilst the pace of change brings enormous opportunity, it does not come without its challenges. Upskilling or reskilling our workforces to take advantage of these innovative technologies whilst reassuring employees of the mutual benefits they bring will be critical to success. Next, in this series, we will look at humanistic AI to understand the role of the human in an AI-first customer experience.